Diagnosing Lateral Epicondylitis in the elbow, also known as “Tennis Elbow”. Presenting equally in men and women, 1% to 3% of the population will experience lateral epicondylitis in their lifetime, usually between ages 35 and 50. 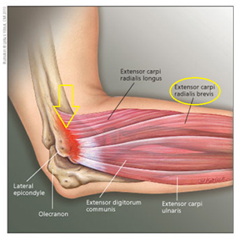 Patients report pain at the lateral elbow that radiates down the forearm. In addition, patients often complain of weakened grip and difficulties lifting objects. On physical examination, patients typically have point tenderness medial and distal to the lateral epicondyle. The histological aspects of the injury to the ECRB origin appears to be multifaceted, involving hypovascular zones, eccentric & concentric tendon stresses, and a microscopic degenerative response. In most cases the lesion involves the specialized junctional tissue (intercel adhesion molecules) at the origin of the common extensor muscle at the lateral humeral epicondyle, specifically the tendonous origin of Extensor carpi radialis brevis (ECRB) first time write in full. And in 35% of the cases the origo of m.extensor digitorum communis and ECRL will also be overstrained. The lesion is characterized by microscopic tears, which may be superficial or deep and situated at the tendinous origin of ECRB into the periosteum of the lateral humeral epicondyle. Microavulsion fractures may be seen as well as lymphocyte infiltration, calcification, scar tissue, and fibrinoid degeneration may be evident in some cases; repair is by immature fibroblasts. 2. The clinician palpates the patient’s lateral epicondyle with one hand, while pronating the patient’s forearm, fully flexing the wrist, the elbow extended. 3. A reproduction of pain in the area of the insertion at the lateral epicondyle indicates a positive test. A study (By Tuomo Pienimäki et al. 2002) found that Pain thresholds at the lateral epicondyles are strongly associated with pain on palpation and a positive Mills test, providing evidence. Wadsworth found that a forceful Mills movement under general anesthesia produces an audible snap and provides good results, although no scientific reason is given. Hereby giving evidence for the effectiveness of the movement itself. The Mills test is a very straightforward test who is described in most of the physical therapy manuals. Knowing that expert opinion is only level 5 evidence, consensus about diagnostic effectiveness by a range of experts, can be used to make weak recommendations where there is lack of higher quality evidence. The Mills test is named after the clinical findings by G Percival Mills, F.R.C.S who published his findings in The British Medical Journal (Jan 7th 1928) and updated this on July 31. 1937. ↑ Nirschl RP, Ashman ES. Elbow tendinopathy: tennis elbow. Clin Sports Med 2003;22:813– 836. ↑ Allander E. Prevalence, incidence, and remission rates of some common rheumatic diseases or syndromes. Scand J Rheumatol 1974;3:145–153. ↑ Pomerance J. Radiographic analysis of lateral epicondylitis. J Shoulder Elbow Surg 2002;11:156 –157.